A Beechcraft AT-11 Kansan bombardier trainer as displayed in the U.S. Air Force Museum. Mizzou’s first airplane, AF-371, started life during World War II as an AT-11. This airplane featured a greenhouse nose and bomb day that could drop a half-dozen 100-lb. practice bombs. The Air Force remanufactured AF-371 to a transport configuration with a streamlined metal nose and the bomb bay removed to accommodate 10 passenger seats. Courtesy U.S. Air Force Museum. Mizzou’s second airplane, serial number AF-645, was built in 1943 and served in the Army Air … Expand ▸Mizzou’s second airplane, serial number AF-645, was built in 1943 and served in the Army Air Corps before being released to civilian use. This airplane is still flying. Courtesy Beech Historical Society. When Mizzou’s leadership team travels, they rise early to hop the shuttle bus for the two-hour ride to board an airliner. Not so with their University of Kansas counterparts. Waiting for them at Lawrence Municipal is KU’s corporate jet. While the MU team cools their heels in a TSA line, their KU equivalents are airborne and talking business. The Kansans will be home for dinner, too, while the MU folks are taking a cab to a hotel, wasting days of unrecoverable administrative time. It wasn’t always this way. From 1960 to 1984, Mizzou operated 10 corporate aircraft. MU even flew agriculture faculty to Cape Girardeau to teach class and then got everyone home in time to sleep in their own beds. MU’s air force was grounded as a cost-cutting measure. Mizzou’s first airplanes were twin-engine trainers that served in World War II. The first was a Beechcraft AT-11 Kansan, a twin-engine airplane with a pair of 450-hp engines, a bomb bay and greenhouse nose for bombardiers. The second was a Beechcraft AT-7, the same airframe as the AT-11, but configured to teach Air Corps navigators long-distance flying skills. After the war, the Air Force remanufactured 900 of these warhorses as 10-seat C-45 transports. The tired trainers were flown to Herington, Kan., where Beech overhauled their wings, fuselage and engines. The Air Force phased C-45s out beginning in 1958 and they were sold as surplus, with federal agencies and state governments getting first crack at them. Oklahoma picked up Air Force serial number AF-753 as its governor’s plane, now an abandoned wreck in Nome, Alaska. In 1960, Mizzou bought serial numbers AF-371 and AF-645. Mizzou’s first airplane, AF-371, had a long and varied life. After its military career as a … Expand ▸Mizzou’s first airplane, AF-371, had a long and varied life. 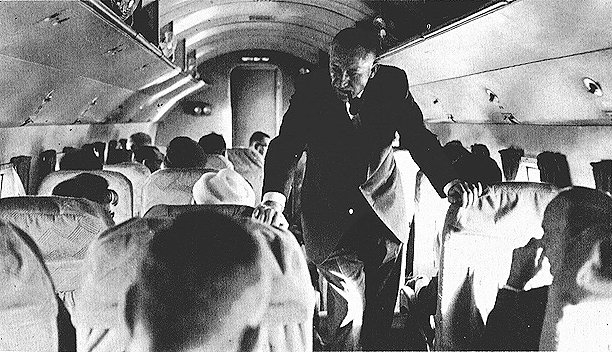 After its military career as a bombardier trainer and transport, MU bought the airplane and spent nearly $20,000 to increase its cabin height, install a civilian interior, and upgrade the engines and radios, among other improvements. The airplane became a freighter after MU sold it. It still flies to airshows from its base in Texas. Courtesy University Archives. MU registered its first war-weary bargain, AF-371, with the civilian tail number N791MU. Mizzou paid $19,800 to convert this airplane to civilian compliance, refurbish its interior, and update the engines and radio gear. Mizzou’s second Twin Beech, AF-645, was given a $14,222 makeover and N792MU as its tail number. Both ships were based at the MU flight department at Columbia Municipal Airport, now Cosmo Park. According to University Archives records, just under a third of flight time was used by the MU administration, the rest was rented out to colleges, the state government and the University of Missouri-St. Louis. Initially, MU charged 14 cents per passenger per mile for the flights. MU records list College of Agriculture faculty on several manifests on flights mostly around Missouri, shaving hours off what otherwise would be a tiresome and dangerous stint of driving. 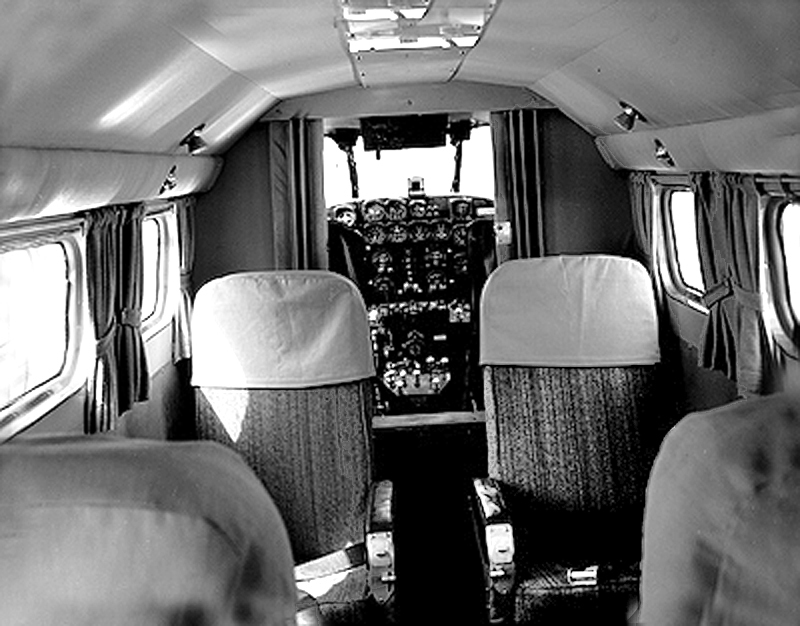 The cabin of AF-371. Courtesy University Archives. Records indicate MU experimented with a scheduled, four-flight daily shuttle between the four MU campuses. A financial analysis in the records suggests the MU airline wasn’t cost-effective as an on-demand service. Both airplanes flew for MU about 15 years before being sold. Today, more than seven decades after its manufacture, AF-371 is still flying with N50GC as its tail number. At some point it was converted into a freighter. Since 1993 it has been based in Texas and flies in the colors of the U.S. Marines. An almost disastrous takeoff incident because of a blown tire was caught on video in 2009. AF-645 is airworthy, too, and based in Louisiana. Restored, it visits airshows with a brilliant blue and white paint scheme. Mizzou’s second airplane was a navigational trainer rebuilt to corporate configuration. AF-645 is … Expand ▸Mizzou’s second airplane was a navigational trainer rebuilt to corporate configuration. AF-645 is seen here boarding passengers on the ramp of Columbia Municipal Airport, now Cosmo Park. Courtesy University Archives. MU’s third airplane was a 1940 Douglas DC-3. 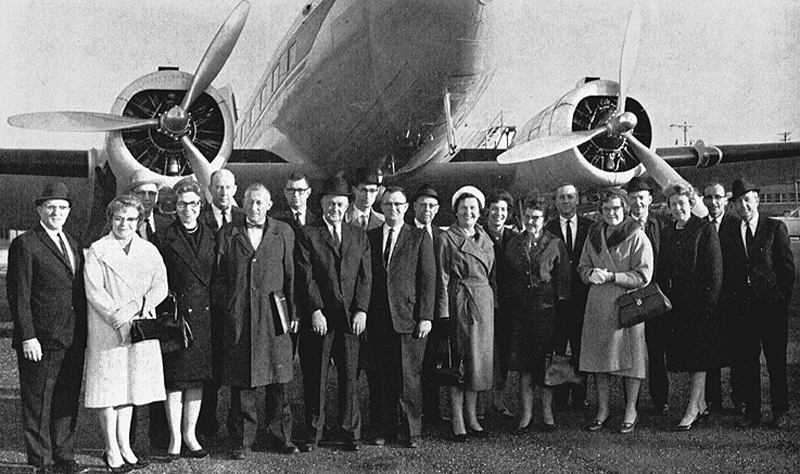 Johnson Wax donated the twin-engine airliner to Mizzou, which changed its tail number to N793MU. 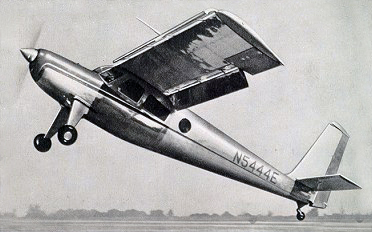 According to a 1964 Missouri Alumnus article, this airplane flew agricultural faculty to Southeast Missouri State College in Cape Girardeau to conduct weekly short courses to area farmers during the winter months when farmers weren’t busy. The courses were popular – there were 361 enrollees the first year, the magazine reported. MU’s flying agriculture instructors pose before the University’s DC-3 before the last plane … Expand ▸MU’s flying agriculture instructors pose before the University’s DC-3 before the last plane trip to the Southeast Missouri State campus, where the courses were conducted. Courtesy Missouri Alumnus magazine. Courses offered were corn and beef production, feeding dairy cattle, principles of landscaping, retail meat operations, right dress for men, leadership, and the selection, care and use of meats. Each registrant paid $5 for the course. Corn production had the largest enrollment with 75 people. On the last day of class, the MU Chancellor hailed the four-week program as a success and praised the collaboration between Southeast Missouri State, the MU College of Agriculture and University Extension. George Carl Schowengerdt, head of MU agriculture, was singled out for his innovative method of bringing the latest discoveries to outstate Missouri via airplane. From the Missouri Alumnus: “Dean C.B. Ratchford, University Extension Service, accompanied the … Expand ▸From the Missouri Alumnus: “Dean C.B. Ratchford, University Extension Service, accompanied the flying teachers and got in some visiting with his staff members en route. Dr. Ratchford said the success of the program proves that people are interested in high-level instruction.” Courtesy Missouri Alumnus magazine. There were 22 instructors in the program. Air travel made it possible for them to leave Columbia Municipal at 4 p.m. and return home by midnight. If they had traveled by car, two days would have been needed. Mizzou sold N793MU in 1972. FAA records state that it was exported to the Dominican Republic the next year. MU operated a fourth airplane around this time, another DC-3, N795MU. Eastern Airlines originally bought this airplane in 1939 as a luxury trans-continental airliner with sleeper berths. In 1941, it was impressed by the military as a C-49E transport for the duration of the war emergency. After the cease fire, it was sold as surplus and reconfigured back to an airliner. N795MU appears to have been mostly used by MU Athletics with Coach Norm Stewart onboard about 50 percent of the time, and who lost confidence in its safety. This aircraft was sold to Basler Flight Service in Oshkosh, Wisc. in 1974 after two in-flight engine failures and increasing maintenance costs of its outdated Wright Aeronautical piston engines. This airplane dropped off FAA records in 1979. 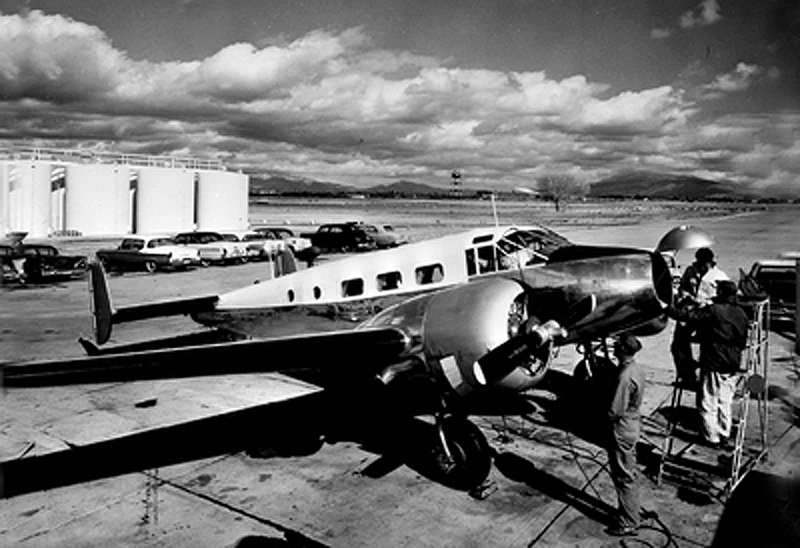 At least for a time, a chartered Ozark Airlines DC-3 was used to transport the team. It featured a “Miss Mizzou” drawing on its side courtesy of Milton Caniff, the illustrator of the Steve Canyon cartoon strip. Both MU DC-3s were reported to be painted in black and gold colors. 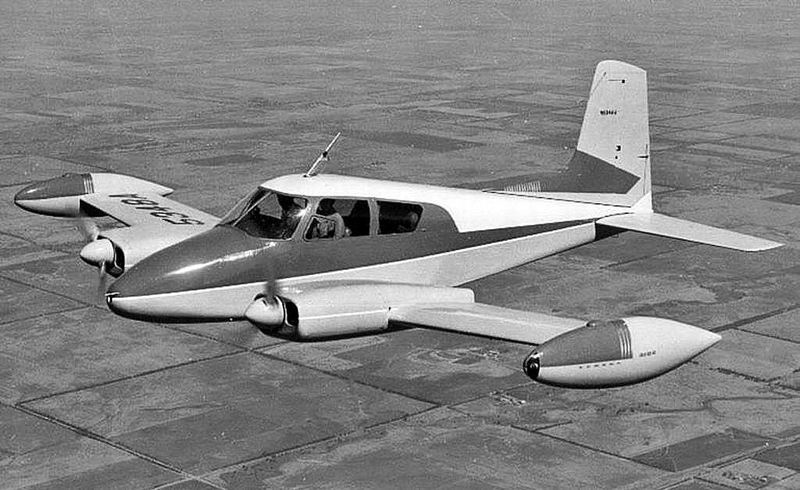 MU’s Cessna 310 was a sister ship to the famous Songbird flown by TV aviator-cowboy Sky King from … Expand ▸MU’s Cessna 310 was a sister ship to the famous Songbird flown by TV aviator-cowboy Sky King from the Flying Crown Ranch. Mizzou’s airplane performed aero-medical missions and was replaced with an air ambulance helicopter. Courtesy Cessna Aircraft. University Archives records indicate a fifth MU aircraft, a twin-engine, ex-USAF 1958 U3A, was obtained in 1971 from the Missouri State Agency for Surplus Property. This was a military version of a Cessna 310, the mount aviator-cowboy Sky King rode to the rescue in Saturday morning 1950s TV shows. In a way, MU’s Twin Cessna continued Sky’s humanitarian missions. Given the tail number N79MU, the airplane ferried patients from outstate Missouri to MU’s hospital, as well as flying radioisotopes to Baltimore. It also retrieved human organs for transplant in Columbia. This airplane was sold in 1979 because its over-the-wing cabin door was too difficult for sick patients to climb into. MU replaced this airplane with its first generation air ambulance helicopter. N79MU is still in operation, based in Pennsylvania. Spy Planes for Agricultural Research? Two intriguing airplanes are mentioned just once in MU Archives. The Helio U10D airplanes were obtained from Army surplus in 1975 to provide agricultural research imagery, the sole mention states. A brief entry in MU records mentions a pair of short takeoff and landing Helio Couriers being used … Expand ▸A brief entry in MU records mentions a pair of short takeoff and landing Helio Couriers being used for agricultural imagery research. Courtesy Helio Aircraft. The U10D is the Army version of the Helio Courier, a short takeoff and landing airplane used by the CIA and Air America during the Vietnam War for counter-insurgency and insertion of agents into enemy-held territory. The airplane’s ability to fly slowly and operate from unimproved strips probably made it useful to view farm fields from the air before the advent of drones. No record of the use or disposition of these airplanes was found in University Archives. Mizzou didn’t just operate ex-military airplanes. Mizzou records mention three Aero Commander 500-series twins, N700MU, N792MU and N794MU. These were much more modern and efficient piston-powered aircraft, able to fly four passengers at almost 200 mph. MU records indicate they flew more than 400 hours per year each on flights across Missouri, the Midwest and to Washington, D.C.
MU’s last three airplanes were Oklahoma-made Aero Commander 500-series. These fast airplanes were … Expand ▸MU’s last three airplanes were Oklahoma-made Aero Commander 500-series. These fast airplanes were significantly more efficient than their war surplus Beechcraft predecessors. The last one was sold to Kansas City Flying Service in 1984. Courtesy Twin Commander LLC. N700MU and N794MU were sold for $39,255 each in 1982 when MU decided to close its flight department. A fiscal analysis showed that MU could save money by substituting air charter for the in-house fleet. In a 1980 letter to Chancellor Arnold Grobman, it was stated that UMKC and MU-Rolla had successfully substituted contracts with local air charter companies with a savings of almost 15 percent. MU Flight Department operations ceased Dec. 31, 1984. 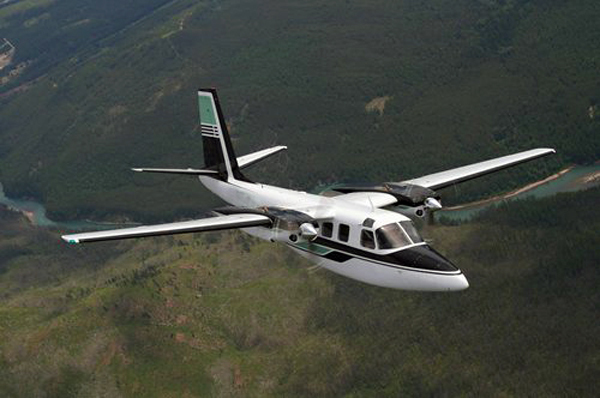 The last airplane, Aero Commander N792MU, was sold to Kansas City Flying Service for $62,500. See other stories about CAFNR’s history here.